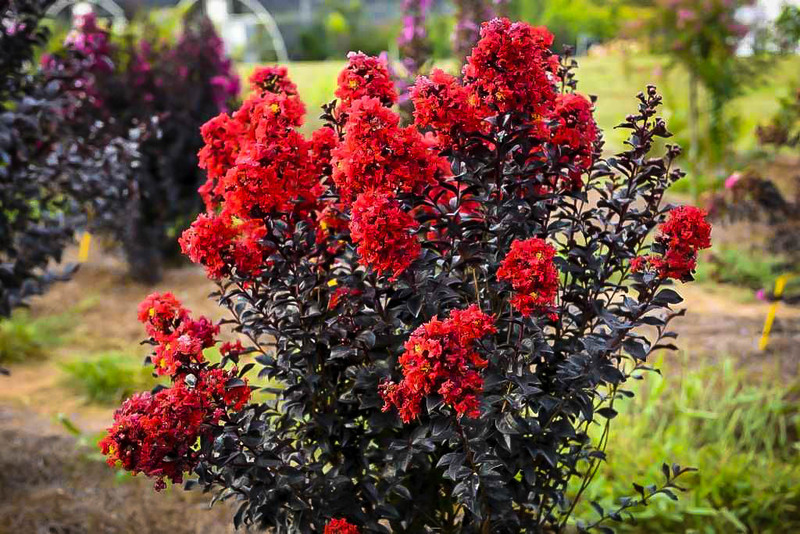 The Sunset Magic™ Crape Myrtle is a marvelous new variety of purple-leaf shrub that also carries rich red blooms for many months of the year. Colored foliage is always loved in the garden, and purple is the most popular color, because it really stands out and contrasts well with other colors, such as golden leaves. This plant has very persistent coloring, holding its deep-purple color all through summer, right up to leaf-drop. It is as good as or superior to other purple-leaf shrubs, and many of those older plants flower for just a few days, and they may have disease problems too. 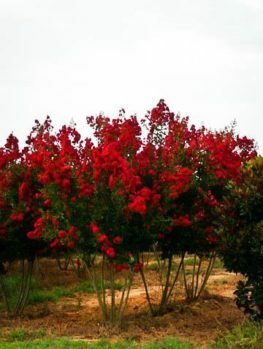 This vigorous plant blooms from June to September, and it is free of the diseases that cause unattractive foliage and leaf drop in older types of crape myrtle. It grows between 5 and 10 feet tall, but stays only around 6 feet wide, so it fits perfectly into the smaller gardens so many of us have today. 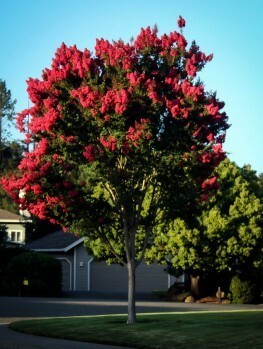 Plant the Sunset Magic Crape Myrtle in a sunny location, so that it flowers prolifically and keeps the richest possible leaf coloring. It will grow rapidly and without any problems in any well-drained soil, growing well even in poor sand and gravel soils. If you have a hot, sunny spot in your garden, this shrub will thrive. It is fast-growing too, so very soon you will have a full-sized plant, bringing vibrant leaf color from spring to fall, and powerful red flowers all summer and fall too. Diseases and pests won’t bother it, and the all-season interest will really bring your garden to life. Shrubs with colored foliage are always popular, but never more than today. This is because they give months of color in the garden for very little work, so rather than growing flowering plants that take lots of care, or shrubs that flower for just a week or two each year, they are all you need for a colorful garden. Modern gardeners love to mix and match shrubs with different leaf colors, and no colors are more popular than rich deep reds and purples – the deeper, richer and more persistent the better. There are other shrubs that have this coloring, such as the Purple Leaf Plum, but no other purple-leaf shrub has the beautiful flowers, long bloom period, and trouble-free habits of the Sunset Magic Crape Myrtle. 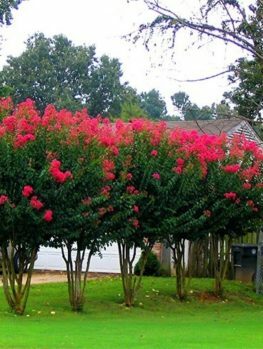 The Sunset Magic Crape Myrtle is an upright shrub, reaching 5 to 10 feet in height, depending on where you grow it and how you prune it. 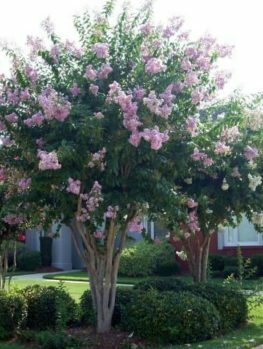 It has a relatively narrow form for a Crape Myrtle, growing only 4 to 8 feet wide, so it is ideal for a smaller garden, or for mixing among other shrubs. 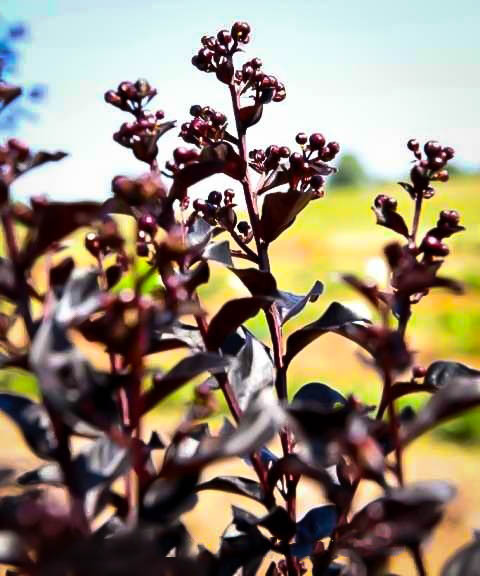 From the very beginning of the spring growth this deciduous shrub produces vigorous, glossy foliage that is a rich, deep black-purple color. This coloring persists throughout the season, all the way into fall, so unlike other purple-leaf shrubs that fade to murky purple-greens as summer progresses, this shrub stays rich and colorful until the leaves eventually fall. But this is not all; once June arrives, or a little later in the northern limits of zone 7, blooms begin to appear. Every branch ends in a large cluster of flowers, 4 ½ inches long and a plump 4 inches across, packed with many flowers. The flowers are a rich red – an almost perfect ‘true’ red – which contrasts with the purple foliage to create a vibrant, majestic effect you will love. Each flower cluster lasts about 10 days, but new ones are constantly being produced, and your shrub will still be blooming away in September, only stopping when the colder weather arrives. 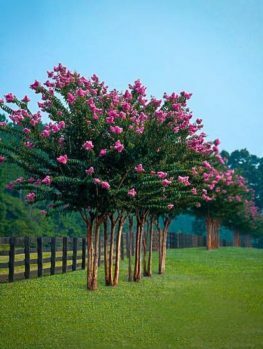 To keep your Sunset Magic Crape Myrtle blooming to the max, remove spent flower heads by cutting back just above the first full-sized leaves. Towards the end of the season, if you stop removing spent flowers you will be rewarded with attractive seed pods, that add interest in winter after the leaves have fallen. 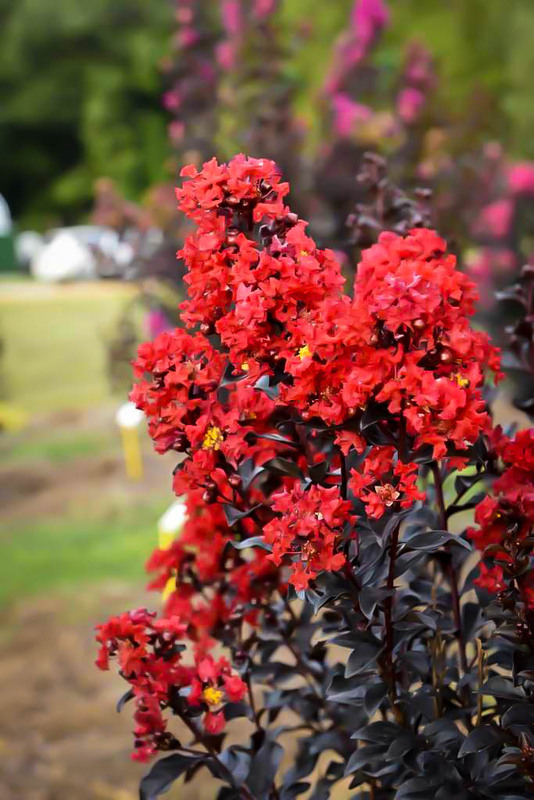 Grow the Sunset Magic Crape Myrtle in a sunny location, to maximize flowering and the intensity of the leaf coloring. It will grow in any well-drained soil, including sandy and stony soils. Once established this is a very drought-resistant shrub, and it thrives in hot, dry weather. 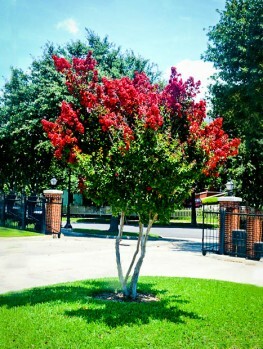 It has been specially bred to resist powdery mildew, a disease wide-spread and common on older types of Crape Myrtles. This disease disfigures the leaves by covering them with a white powder in summer. As well, this tough plant is resistant to the more serious Cercospora leaf spot disease, which causes sever spotting, followed by leaf fall and defoliation. You can forget about these diseases with this variety, and it is rarely troubled by any serious pests either. 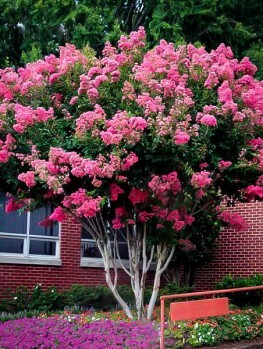 Usually it is recommended that Crape Myrtle should be pruned in spring, but this shrub has been bred to give it a free-branching habit. This allows it to form a dense, finely-textured form naturally. You can still prune in the traditional way if you choose to. To do this, cut back the branches by one-third in early spring, removing weaker branches, or cutting them back by two-thirds to stimulate stronger growth. You can also prune up to create a short trunk and a more tree-like form. The Sunset Magic Crape Myrtle is the latest and best in the Magic™ series of dark-foliage Crape Myrtles, bred by a member of the team of the well-known and highly-regarded plant breeder Michael Dirr at the University of Georgia’s affiliate company Plant Introductions Inc. Joshua H. Kardos was the breeder, and he has produced many wonderful varieties. 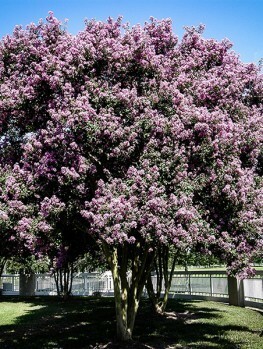 Breeding purple-leaf Crape Myrtles is one of his special areas. He created numerous plants before reaching the pinnacle of Sunset Magic™, which is patented under the cultivar name of ‘PIILAG-IX’. These plants are the result of a complex breeding program, and Joshua Kardos only patented this, his latest creation, in 2018. Our plants of this fabulous multi-purpose shrub are produced for us under license by Baileys Nurseries, as part of their First Editions® series, the pick of the latest introductions of new plant varieties to satisfy gardeners. There is always enormous demand for the latest introductions, so we know these plants will be shipped out very soon. 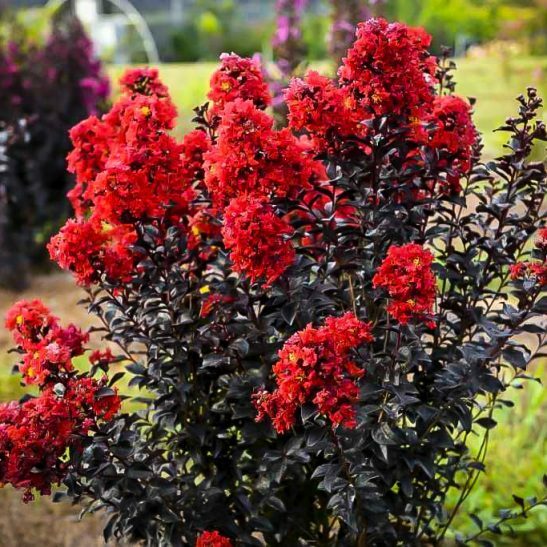 Order now while we still have supplies, and you too can enjoy the combination of rich purple foliage and dramatic red flowers that is only available in the Sunset Magic Crape Myrtle.